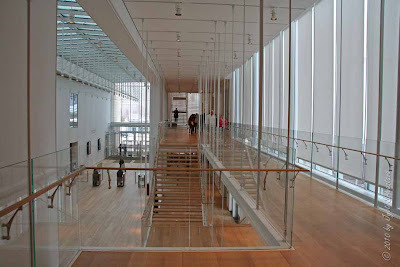 Art Institute of Chicago[AIC] - Modern Wing.. The 264,000 square foot of Modern Wing houses collections of modern European art and contemporary art, with new gallery space for the collections in photography, architecture and design. 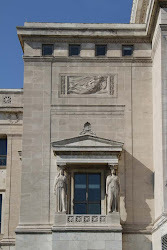 Some of the salient features of the Modern Wing includes .. The design includes an element called "reveal", which is a "slight gap" where walls, pedestrians and benches, do not seem to meet the floor. This feature makes everything appear to be floating just an inch off ground. This gives an illusion of "zero gravity"..
One can easily notice the use of natural lights in the museum.. The galleries in the east pavilion are lit by filtered natural lights. Sitting atop the entire east pavilion is approx. 2,000 stationary extruded blades, called the "flying carpet". The blades are shaped to bring north light, the safest for works of art, into the third floor and to shield the gallries from the southern, or harshest exposure..
For the Modern Wing, Piano devised a proportional system based on the measurement 6 feet, 3/4 inches. Everything in the building, from the width of white oak floorboards, to the height of the walls, and the sections of glass facade, is a multiple of this measurement. The Modern Wing uses a large amount of natural lights to illuminate the galleries. The artificial lighting is calibrated to the amount of daylight coming in, which insures that light levels remain constant while natural light fluctuates throughout the day and season. Additionally the north facade is actually composed of two separate sections of glass with an air cavity in between. This cavity is the space in which air can be heated or cooled, ensuring that no outside air directly encounters a gallery wall. This climate-controlled cavity also saves on the amount of energy needed to heat or cool galleries depending on outside temperatures and humidity. For more on.. [click on the link]..
For beautiful pictures of Chicago!